LAKE ELSINORE, CA – December 13, 2017 – Fittingly enough a crew of legendary racers wrote their names into the history books by winning the 50th Anniversary of the SCORE Baja 1000. The No. 45x BREMEN-Arredondo-Haines Racing Honda CRF450x was first to leave the start in Ensenada and finished the gruelling 1134 mile course with an official time of 21:07:17 taking their third consecutive race win and clinching the 2017 SCORE motorcycle championship. “We knew it was going to be a tough fight for us,” says the team’s rider of record Francisco Arredondo. 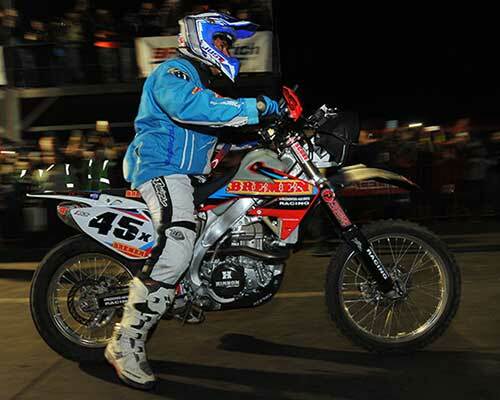 “The 50th Anniversary of the Baja 1000 is special, so we really gave it our all to try and win. The goal has always been to win the championship, but to do it by taking the Baja 1000 is a dream come true!” Headed by Arredondo, a professional Grand Prix equestrian, businessman and global adventurer from Guatemala, and Hall of Fame mechanic/racer Chris Haines, the team was established six years ago specifically to win the SCORE title. As if winning the 50th anniversary Baja 1000 wasn’t already enough, Francisco also won his second SCORE World Desert Championship Milestone Award for finishing each of 2057.97 required miles in the four round 2017 series. “Mission accomplished,” says Shane Esposito, who has paired with Arredondo to win some of the toughest races in the world, including the Longest Race In America, Vegas To Reno. “This has been been a big commitment by everyone. It has been really serious for us as a team these past two years, so to finally win it has been a big relief!” Earlier this year Esposito accepted Francisco’s invitation to compete in his first ever rally in North Africa. Joining the veterans Esposito and Arrendondo were AMA Hall of Famer, Supercross title holder, National Enduro champion and now 5-time Baja 1000 winner Ty Davis, ISDE gold medalist and 2-time Baja 500 winner Justin Morgan and 2-time Baja 1000 winner and 2-time SCORE champion Max Eddy, Jr. “We really assembled a dream team here,” jokes Haines. “However credit our entire crew for making the dream a reality.” As a 15-time Baja 1000 class winning rider in his own right, Haines has clearly translated that experience into a builder of elite racers and championship winning teams. Lead technician is Jimmy Holley; Suspension: Bob Bell and Phil Valdez from Precision Concepts; Computer Tech Support: Steve Bourgeois; Helicopter Crew: Steve Wright (former Team Honda ATC champ and Baja 1000 winner) pilot, Matt Eddy Medic/Spotter and team logistics: Carrie Hancock. As always the many volunteers manning the remote pits are the unsung heroes of any desert racing victory. ABOUT US: The BREMEN-Arredondo-Haines Racing Team was established 6 years ago with the intent to capture the SCORE championship. Headed by Francisco Arredondo, a professional Grand Prix equestrian from Guatemala, and Hall of Fame mechanic/racer Chris Haines, the team has a wealth of experience with nearly 30 Baja titles between them (Haines has 15 Baja 1000 class wins by himself). In 2001, Haines was awarded the prestigious “Amigo de Baja California” award by the Governor and Secretary of Tourism of Baja California. The honor reinforces Chris’ outstanding decades long relationship with the people and government of Mexico.